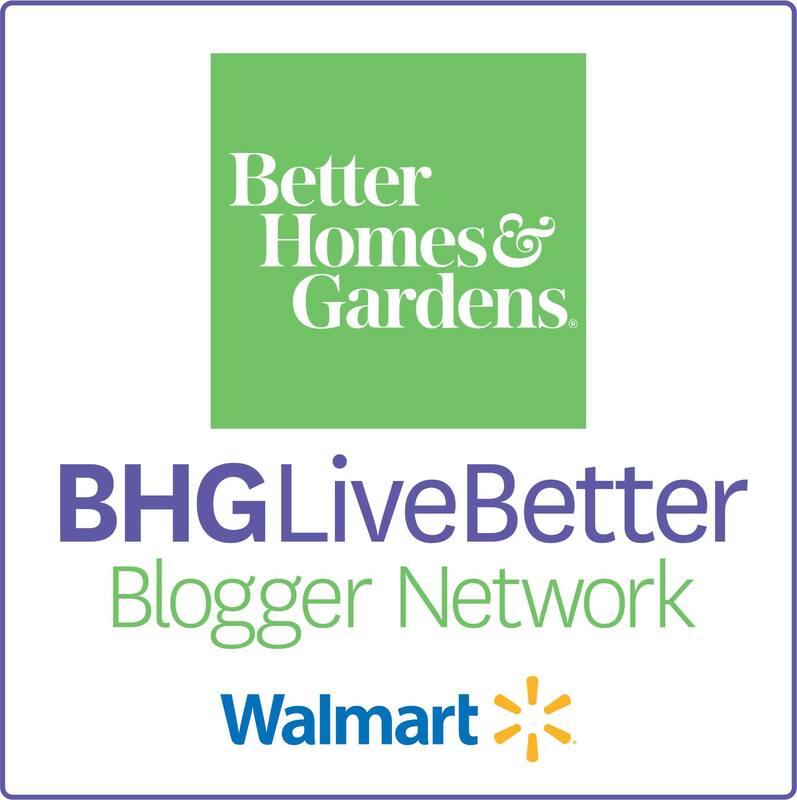 I’m a member of the Better Homes & Gardens Live Better Blogger Network but all opinions are my own. This year for Mother’s Day I decided to throw a little lunch party for my friends–and they are all mothers as well. I’ve been so blessed to have been able to make some amazing friends in my neighborhood and we’ve gotten really close. Throwing these little parties is so fun and a great excuse to get together! 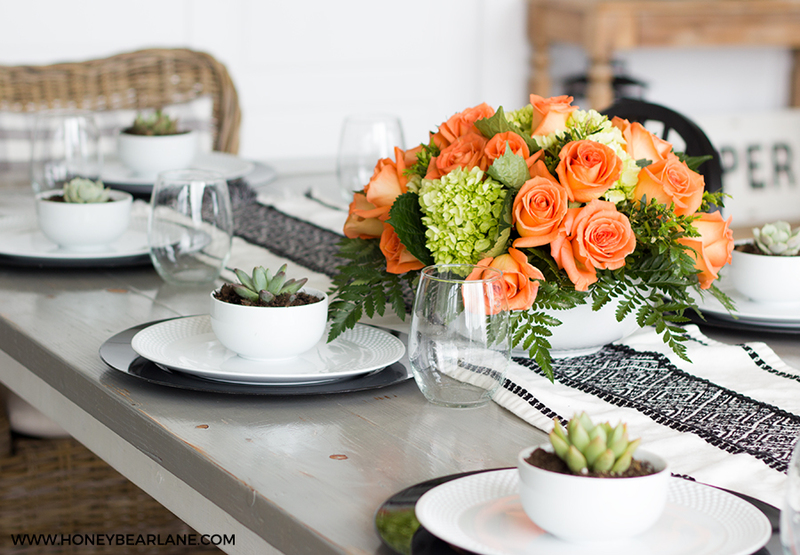 To prepare for the party, I decided to set the table with a beautiful handmade Mother’s Day centerpiece. 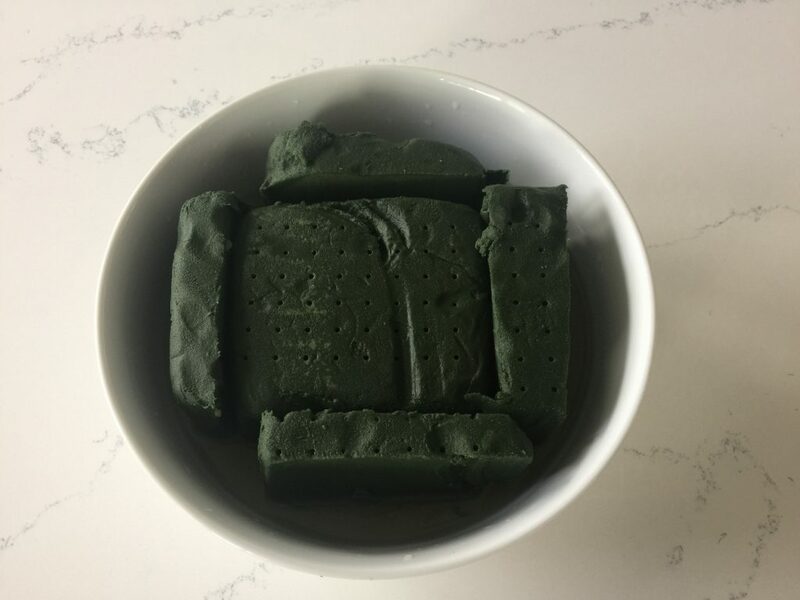 These are not hard to create at all and look so gorgeous! 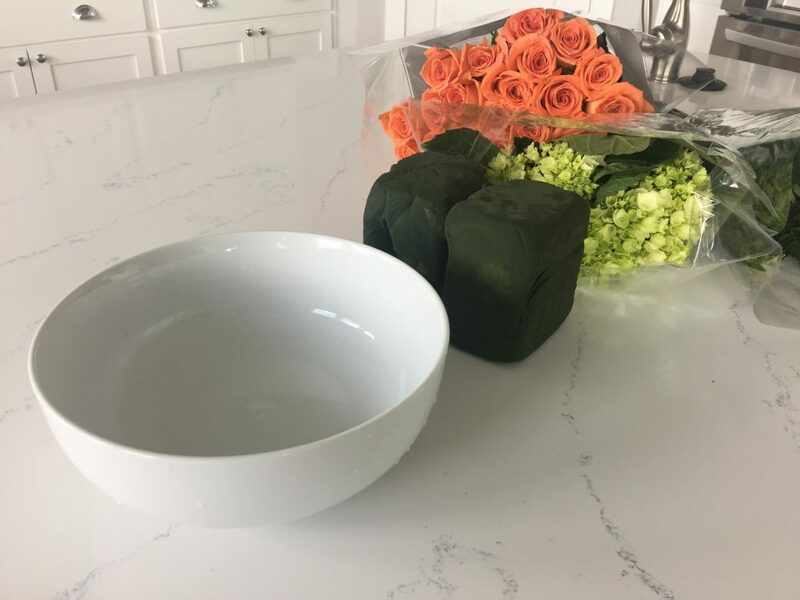 Step 1: I first started with a Better Homes & Gardens white ceramic bowl. This is the perfect vase for a centerpiece. Then I soaked some floral foam in water and that flower food stuff and put it in the bowl so it was several inches above the rim of the bowl. The floral foam wasn’t tall enough so I had some other foam which I put underneath it to elevate it. 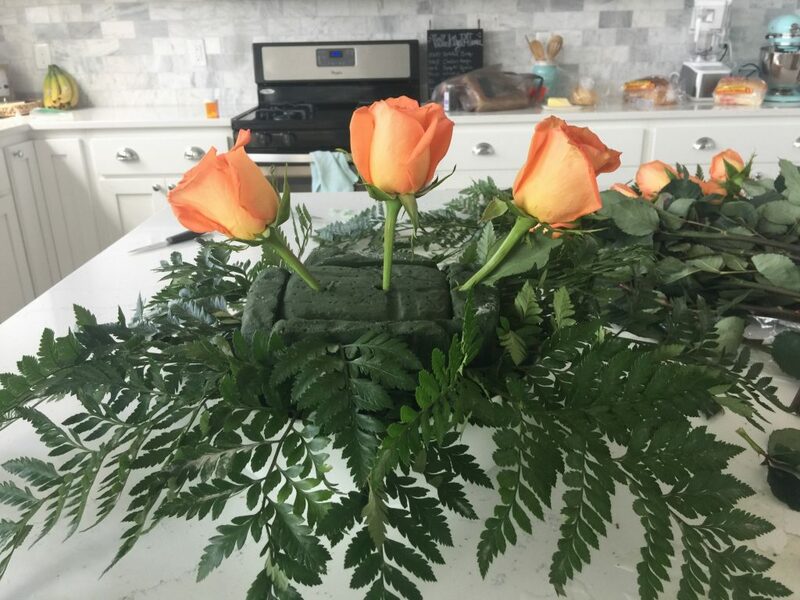 That being said–make sure it’s ALL floral foam because my arrangement died faster than I wanted it to because I don’t think the flowers were getting enough moisture. 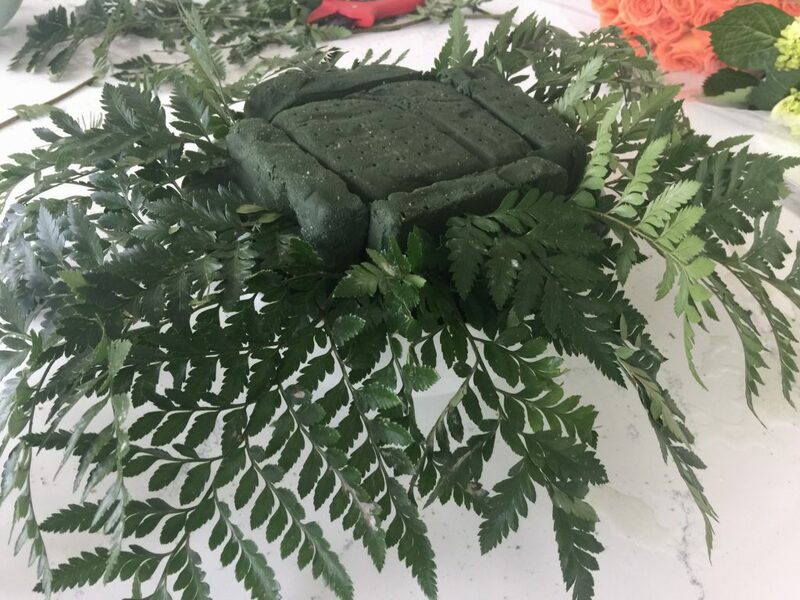 Step 2: Line the base of the foam (the part right by the ridge of the bowl) with greenery, and I used leather leaf ferns here. I really wanted some other greenery like eucalyptus but they didn’t have any in the three stores I went to and I didn’t have time to go anywhere else. Boo. Why can’t grocery stores carry some prettier greenery? Anyway, if you have it, use it here. Just cut the stems and poke it through. In this photo the ferns are pretty large but I went back and made them smaller later…just save yourself some time and make them smaller to start with. Step 3: After the greenery collar, you cut some roses so the stem is about 5-7″ long and insert it in the top like this. Step 4: Then start placing them evenly spaced throughout the foam, making them even in height so it forms an arc. 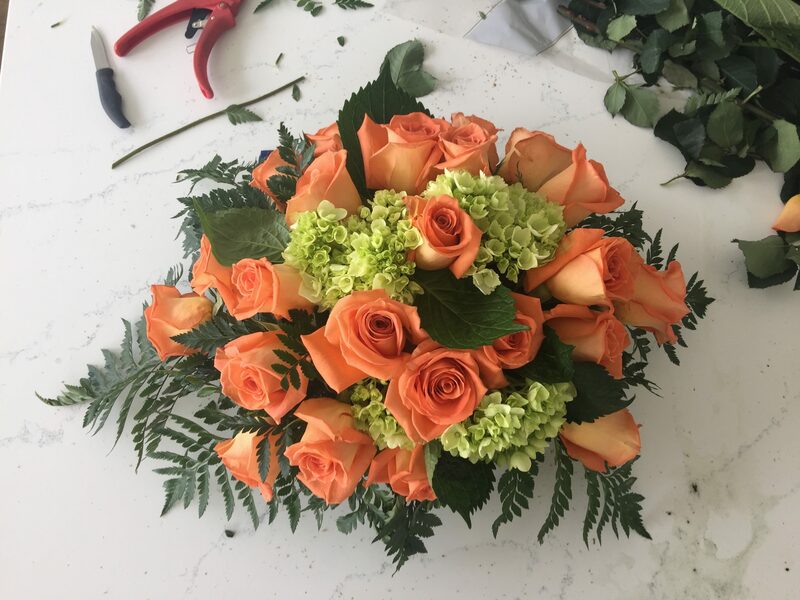 Don’t leave the stems too long because your arrangement will look top-heavy and you’ll need a ton more flowers to fill it in. Don’t use all the roses yet, leave a few to fill in gaps. Step 5: After the roses, you can cut the hydrangeas and fill in the spaces with these. I actually wish I had more hydrangeas for this, I just love the greenery in arrangements. 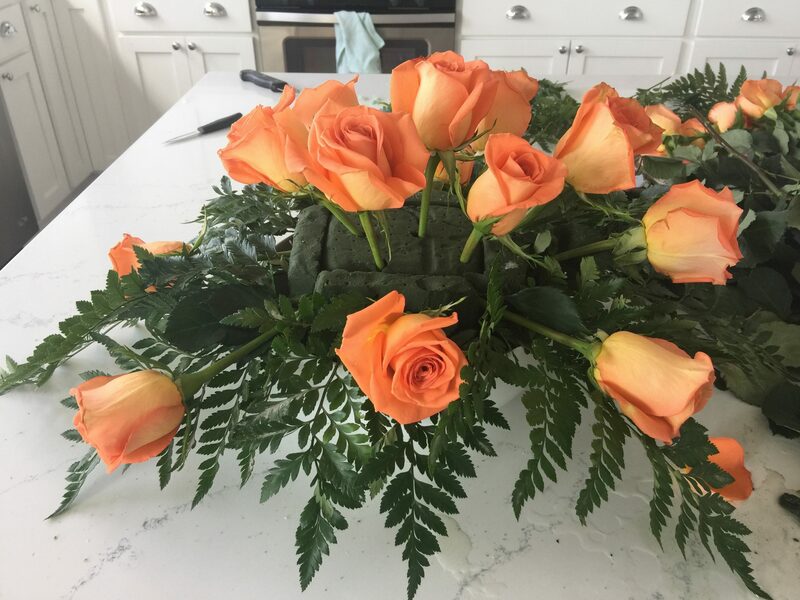 Make the flowers mostly all the same height so it forms a nice round top. Step 6: Then start filling in the gaps with your other roses and any small green filler. I actually went outside and clipped some branches off my boxwood bushes to add a little variation and I love it. Seeded eucalyptus looks gorgeous here. That’s it! Just make sure that you keep it moist throughout the lifespan of your centerpiece. 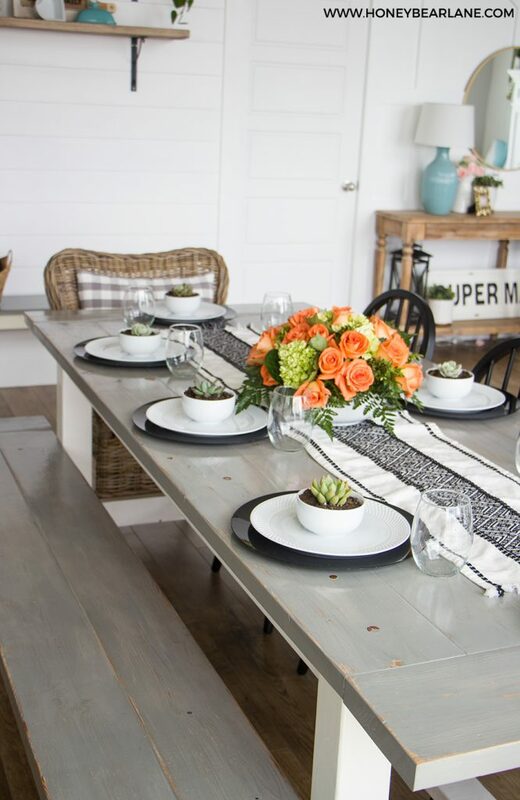 Now that I completed my Mother’s Day centerpiece, I set it on top of this beautiful Better Homes & Gardens black and white table runner and then set the table with black chargers and my Better Homes & Gardens hobnail plates. 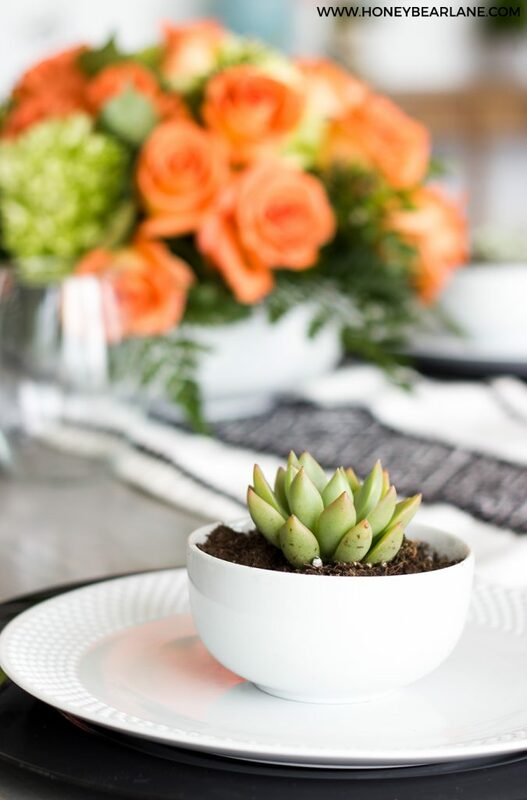 Then I planted mini succulents in these little Better Homes & Gardens white ceramic bowls to set on their places as gifts for them to take home, which they loved! 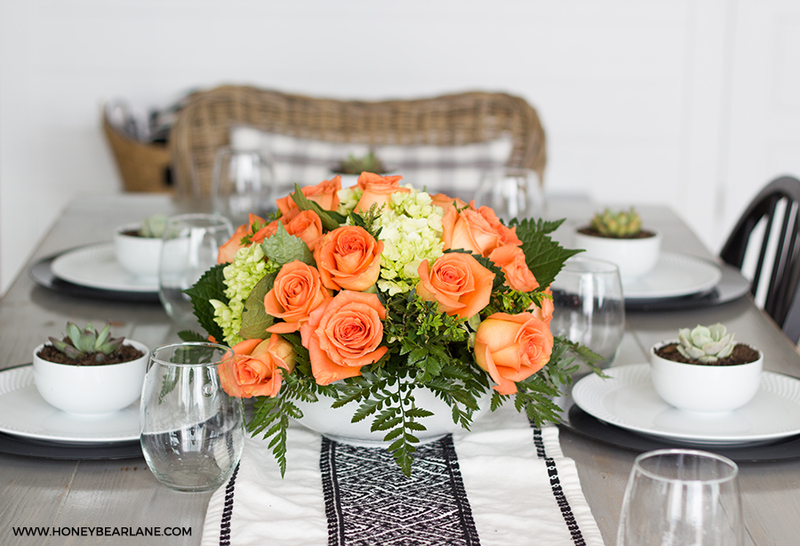 Get this look for your own Mother’s Day centerpiece and party! Want to throw your own Mother’s Day lunch or give your Mom an awesome Mother’s Day gift? 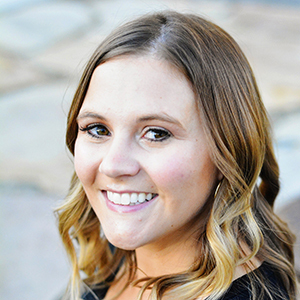 Enter to win a $50 Walmart gift card below! 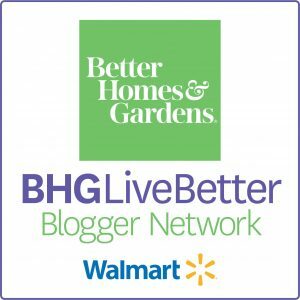 I’m super excited to be a member of the Better Homes & Gardens Live Better blogger network–please check them out on social media!